Daenerys, sitting on the throne. 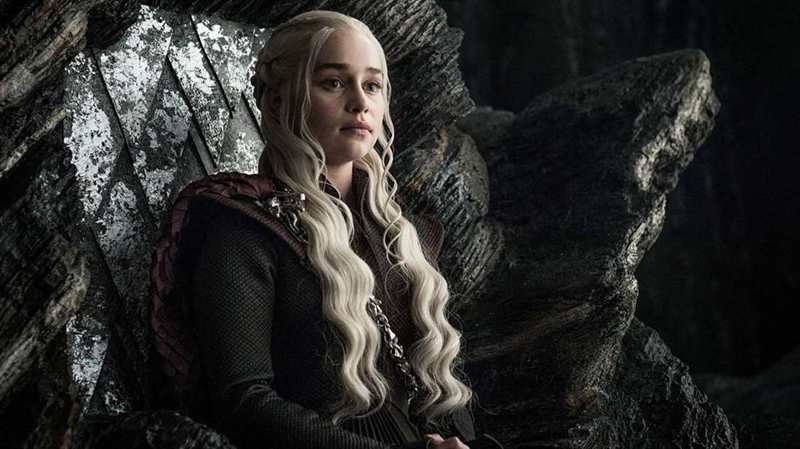 The saga of the Iron Throne is slowly winding its way to closure, though the next book in A Song of Ice and Fire, The Winds of Winter, is still just a gleam in the eyes of long-suffering fans. In a recent interview with The Guardian, George RR Martin discussed frankly the challenge in putting together his latest novel, and why supplementary works like Fire and Blood have come out before it. That might be frustrating for a lot of fans, but it makes sense: plotting like Martin’s is as much choreography as creativity, and at some point it becomes a massive, massive undertaking. Putting that together, especially without the help of a writer’s room, must be incredibly difficult. Creative work is, well, work, and it’s nice to see Martin talking frankly about it, even as he’s probably never been under more pressure. There’s more fun in that interview, too, including shedding some light on the process behind Fire and Blood and the revelation that Martin is working with HBO on a couple other projects that he can’t share anything about just yet. It’s not clear when The Winds of Winter will come out, but Game of Thrones will return to TV next year. Postal Apocalypse: Why Doesn&apos;t George R.R. Martin Just Release Shorter Books?